Eating at restaurants when you’re a vegetarian can be frustrating. Eating at restaurants when your diet is vegan? Even more so. Often there will only be a couple of token veggie options on the menu, and if you want vegan food? Forget it. Thankfully, times seem to be changing. I’ve had a couple of really good experiences at chain restaurants recently so in the spirit of Veganuary I thought I’d share them, just in case anyone needs a boost or some ideas. The problem with Toby Carvery is you end up piling everything on your plate. 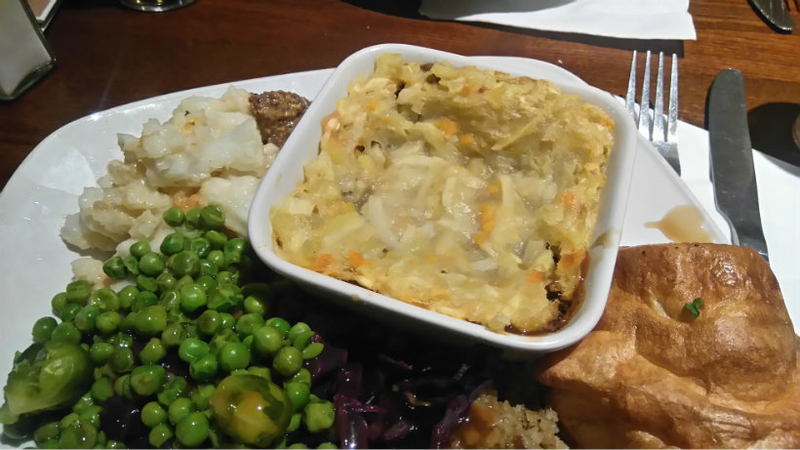 Cottage pie was never a food I ordered or enjoyed when I ate meat, but I love lentils and veg and a pie seemed like the kind of thing that would go best with a traditional roast. The lentils, carrots, and peas are cooked in a gravy/sauce, then topped with parsnip mash. The gravy was so good, really rich but not too heavy. I also thought there was a good balance of mash and filling. 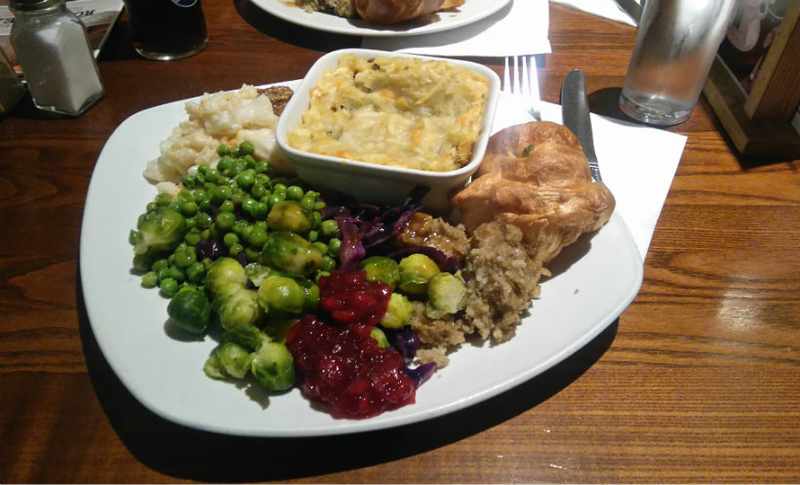 You go up to the counter to get your vegetables as usual, and I must admit I went a little overboard with everything, particularly the stuffing (I didn’t get any at Christmas and this one is vegan. There’s also vegan gravy, although it’s labelled as vegetarian). One thing to note: the vegetables are cooked in butter, but they can be steamed separately if you want. It was only after coming across Sarah’s post that I realised this, even though all the posters show the veg with a knob of butter on top, but it’s definitely something to bear in mind if you’re dairy-free. 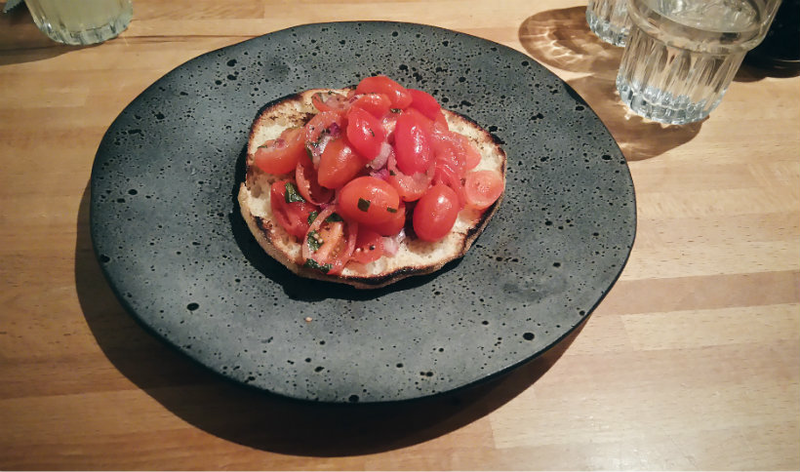 Zizzi is somewhere I visit quite regularly with my friends so I was really happy when I learnt they had a whole separate vegan menu. And what a menu it is! Five different starters, including garlic bread; a salad; sides; pizzas (with plenty of toppings to choose from); two different pastas (with extras if you want) and two desserts. They even have a note about vegan wines. My days of wolfing down a three-course meal are long gone, so I ordered a starter and a main. The bread was perfectly toasted and not too soggy from the tomatoes (a pet peeve of mine). There was plenty of garlic, red onion, and tomato, with a drizzle of olive oil to bring everything together. I bloody love bruschetta. Excuse the quality of the photo — they dimmed the lights, which is great for mood but rubbish for pictures. I’ve yet to have a good experience with vegan cheese so I went for the safe option and ordered pasta over pizza. My lentil ragu was packed with flavour and very filling — I didn’t actually finish my bowl, although that may have been because I ate the bruschetta. 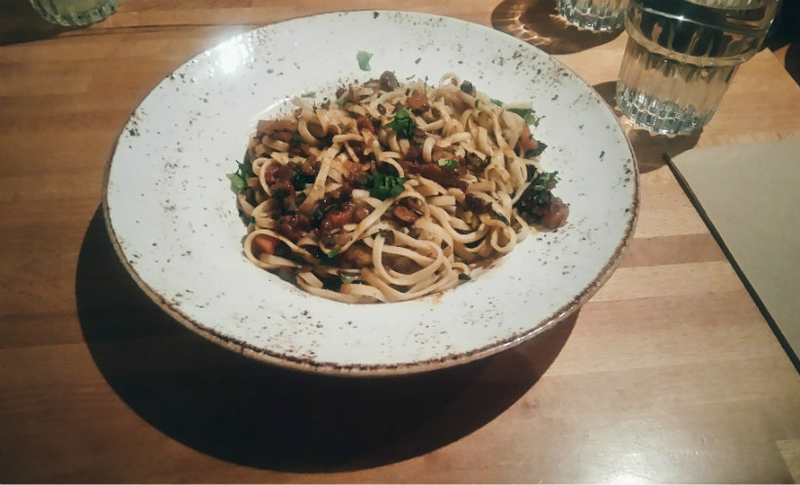 The linguine was mixed with lots of lentils, tomatoes, and herbs, and I think there was a little bit of carrot in there too. This is a dish I’d try making at scratch from home when I needed a pasta fix. Overall, I’m really impressed with both Toby Carvery and Zizzi. None of the food felt like an afterthought — far from it — and staff were friendly and helpful when I asked for the vegan options. What are your experiences of vegan/veggie food at chain restaurants? Are you attempting veganuary this year? Let me know in the comments!